You just became (or are planning to become) a proud guardian of the incredible bundle of joy that is a Jack Russell Terrier puppy and aren’t entirely sure if you have everything that they need to be comfortable and happy? No need to worry, here are the basic things that every JRT puppy and their guardian should have at hand. You wouldn’t sleep just anywhere, neither would your puppy. They have to have a comfortable place that they can call their own. It should be situated somewhere in the corner of the room so they aren’t in the way of your daily activities and can have some alone time without being disturbed. When choosing the bed, their sleeping habits are very important, but you can’t really know them until they’ve figured it out for themselves as they get older and you two get to know each other better. For instance: do they like to have a blanket over their head like my Kala, prefer a fluffy or harder surface, scratch and arrange the bed before lying in it, use it often, play in it? You also have to factor in the wear and tear and the fact that they’ll grow so you have to be aware that over time you’ll buy several beds. Rule of thumb is that for them to be comfortable they need to have a bed in which they can completely stretch while lying on their side. I recommend the Best Friends by Sheri Luxury Donut Cuddler – an extremely comfortable, warm and stylish dog bed for your furry friend to enjoy. As it is a soft and fluffy bed there is a chance that your pup might want to nibble on it so you should train them to suppress such behavior. On the other hand, you have the versatile and strong, indoor-outdoor Gale Pacific Coolaroo Elevated Pet Bed. It’s raised so that there’s airflow all around your pet’s body to help cool them off during the summer heat. According to some it also helps during training because your pet differentiates the rest area more easily than if it were at ground level as regular beds are. If you know that your dog is going to be left home alone at least part of the day (for instance, while you’re at work) it would be best to crate train them from the get-go. 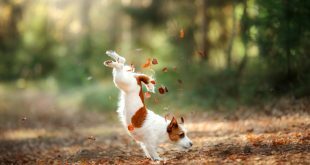 Jack Russel Terriers are prone to destructive behavior when bored and left on their own, so it’d be in your best interest to invest in a sturdy yet spacious crate like the MidWest Life Stages Dog Crate. The crate must be large enough that your dog can stand up and stretch with enough room for their water and food bowl to be placed inside beside their comfy pillow. The pillow must fit the crate and I recommend the soft and easy maintenance MidWest Deluxe Bolster Pet Bed. You must get at least two bowls – one for water and one for food. Ideally, you should have at least one spare so it can be used while one of the bowls is being cleaned. Stability of the bowl is a big factor because puppies often step on the rim of the bowl which can cause spillage. Avoid plastic bowls – they’re often porous and damage easily. Choose stainless steel bowls or ideally ceramic ones instead – they’re easy to clean and will last you a lifetime. Bone Dry DII Ceramic Pet Bowl is a high-quality dish set with a nice visual design. It has a flat bottom for stability and its silicone rim prevents it sliding all over the floor. If you prefer lightweight stainless steel, then I recommend the sturdy GPET 2 bowl set. They can hold up to 32 oz of food or water which is enough even for bigger dogs, but their larger size will prevent flipping and spilling and discourage your pup from dropping the food on the floor while eating. They also have an anti-slip rubber bottom. Whatever kind of bowls you choose to use, it’s a good idea to place them on some kind non-slippery surface to prevent your playful pup from driving it around the floor with its nose in the heat of fine dining. Reopet Silicone Bowl Mat is easy to clean, anti-slip floor pad with raised edges so any spillage remains contained on the mat and keeps your floors and rugs from staining. Puppies need to learn proper table manners just like we do. Simply slurping down the whole meal, although convenient, isn’t good for their digestion. If you notice that they started eating too fast or even just “vacuum” food from a normal bowl consider getting a slow feeder. They’re the bowls specially designed to slow down your dogs eating by placing various obstacles and intricate designs in their way so they have to work a little more and think about what they’re doing to get to their tasty lunch. An excellent example is the imaginative Outward Hound Interactive Dog Bowl. It’s labyrinthine design and raised edges will make them think twice how to get to the next delicious lick and bite. As I’ve mentioned before in my article how to choose the best dog harness, a harness is by far the best choice for any dog. Neck collars can restrict their breathing and, with sudden jerks, even damage their neck and trachea, especially while they’re young, delicate, untrained and unaccustomed to them. Harnesses distribute the pressure on their torso so sudden lunges in unexpected directions aren’t as traumatic on their body when suddenly stopped by the leash. I personally recommend the RUFFWEAR – Front Range No-Pull Dog Harness. It has a front clip harness which will actually help you leash train your dog. The position of the leash clip will actually make them turn facing you if they suddenly choose to run towards something which offers you more control and easier handling. It’s adjustable, but if you’re worried about spending money on something that your dog might overgrow soon you should maybe think about some cheaper but still quality alternatives like the soft Puppia Dog Harnesses. The important thing is that the harness is comfortable for the dog and that you can adjust it as the puppy goes through its growth spurt. You can, and should, invest in a high quality, durable harness at a later point when your dog is fully grown. If you decide to use a collar make sure that it can be easily adjusted and is well padded in the front like the great Mighty Paw Padded Dog Collar. That way it’ll be comfortable for them to wear and reduce possible injuries to the neck area while walking on a leash. For the same reason I recommend you to avoid leather collars with puppies – they’re too hard and stiff. When you are leash training your pup, avoid using retractable leashes – they reward your puppies negative behavior (puppy pulls – leash extends), and could potentially harm your puppy when they suddenly stop their movement as they’ve already gained forward momentum. You want to train your puppy to walk safely by your side when on a leash, and not wander around aimlessly potentially getting into trouble on the street. The starter leash should be lightweight so it’s not too cumbersome for your puppy but soft and durable so it can endure their constant nibbling. Therefore you should consider getting a nice, traditional nylon leash like the PetSafe Nylon Dog Leash. Leather leashes are quite expensive in comparison to other leashes and they’re certainly durable (with proper care it could last you a lifetime) but the curious puppy will most probably want to chew it all up from the start. On the other hand, if you start training them from the get-go not to chew on the leash it may be a solid investment. I strongly recommend implanting and registering a microchip even if it’s not mandatory in your area. Our pooches don’t carry around their wallets and ID so it’s the safest way for them to always have all the information and your contact data with them in case they get lost. The procedure is harmless and almost painless (like a little nip). They won’t ever even know the microchip is there and could save you a lot of grief in the long run. Just remember to update the information when necessary. Dog tags are the next best thing. They must contain the name of the dog, name of the owner and a contact number at which you can be reached in the circumstances that you lost your pet and somebody found him/her. The best thing is that you can make them fun and unique as the charming and customizable If It Barks Engraved Pet ID Tags. Every kid loves toys. Puppies are the same. Just don’t spoil them – if they have access to many toys all the time they’ll quickly get bored with them and be inclined to develop possessive behavior towards them. Toys should be reserved as a big reward which you dole out for a job well done so they shouldn’t always be within their reach. Soft squeaky toys are sure to get their attention and will be gentle with their still sensitive teeth and gums. Check out the incredibly adorable ZippyPaws NomNomz Plush Squeaker Toy. During the teething period, puppies go through a chew-mania and you’ll always be looking for something to divert their curious mouth away from the furniture or you for that matter. KONG PUPPY is a fun, durable and versatile toy for your pup. It can be used as a chew toy, to play fetch or simply fill it with various yummy treats and see how they come up with new ingenious ways to get to them. It never gets old. Thanks to their growing bodies, puppies have somewhat different nutritional needs than adult dogs. They need higher fat and protein content (22% protein, 8% fat) and more meals a day than their full-grown counterparts. 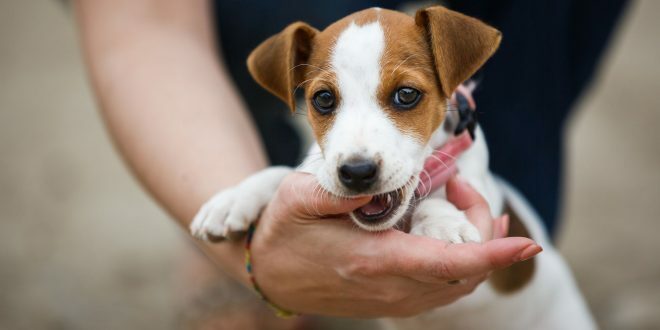 Jack Russell Terrier puppies need to have an average intake of 800-900 calories a day divided into 4-6 meals. Ask the person that took care of the puppy up to that point what food did they give him/her so that, at least in the beginning, you can feed them the same to ease the transition. Always choose high-quality dog food and read the labels – if all the ingredients aren’t clearly listed on the packaging, skip it. Almost all manufacturers today make special dog food formulas that are nutritionally fit for puppies so you should choose such formulas over regular dog food meant for adult dogs. Choose something like delicious Taste of the Wild that forgoes grain fillers to make digestion easier and the meal more wholesome. You mustn’t forget about yummy treats – after all, at this age, you’ll probably spend a lot of time in training and you have to have some special rewards handy for that hardworking pup. Choose something like the tasty and healthy Wellness Puppy Training Treats. Potty training is one of the most basic and important skills that your dog will learn. It also takes time and is often more arduous for you and your puppy than many other skills. All-Absorb Training Pads take some of the strain away by enabling you to provide them with a place to go do their business even indoors without any need for scrubbing the floor afterward – what happens on the training pads stays on the training pads. Brushing their fur isn’t just for cosmetic reasons. That way you help them get rid of dead hair, dirt, and bugs that accumulate over time. To get them accustomed to the whole experience start with a soft, gentle brush like the Hertzko Self Cleaning Slicker Brush. You can also read my tutorial on how to groom your Jack Russell. When it’s bath time, you’ll need to use a dog shampoo (preferably natural based). JRTs have to have coarse hair so don’t use conditioner under any circumstances. For their comfort, the shampoo should be gentle and mild like the excellent Viva La Dog Spa Dog Shampoo. This are some of the basic necessities that you simply must provide for your beloved new companion. As time goes by and you get to know each other better and better you’ll know what to look for in a product meant for your four-legged friend. While they’re young you’ll both experiment and try out new things together and that’s half the fun. Is there something you’d like to add to the list? We’d like to hear your suggestions in the comments below.